Instead of using plain melted butter in my recipes, I looove using browned butter instead. 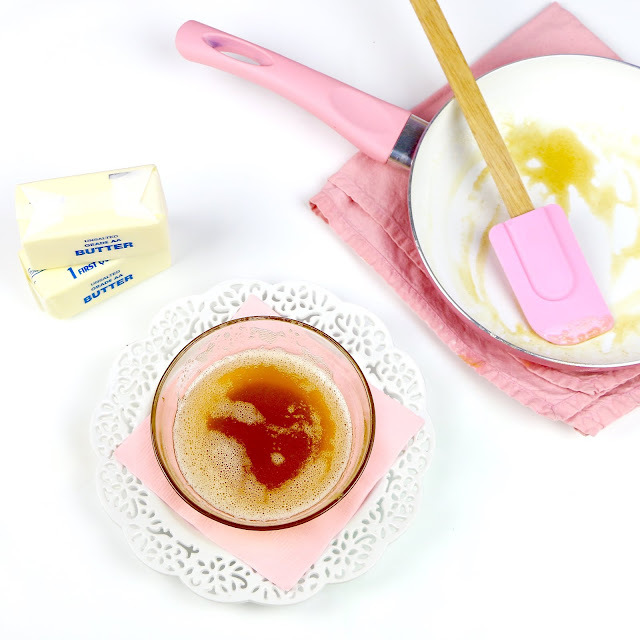 It adds a whole new dimension of caramely, toffee-like flavor to your recipe that is so incredible, you will have to try it to believe it! 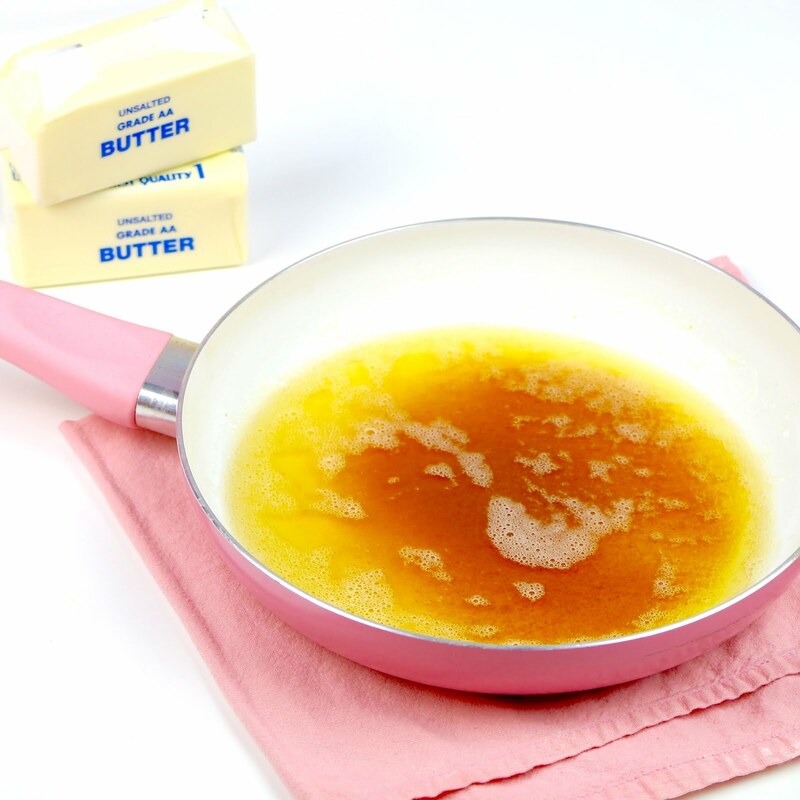 Brown butter is just regular melted butter that is cooked until it starts to turn a brown color. The water in the butter evaporates as it melts and the milk solids sink to the bottom of the pan and brown into the little dark caramel scented specks as they cook. 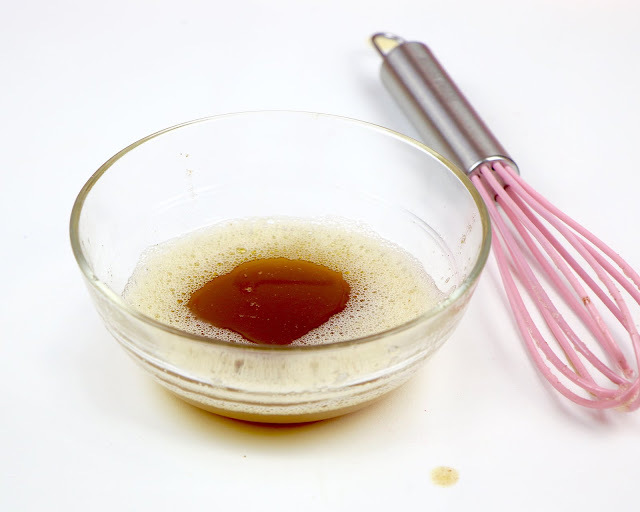 This liquid gold adds a deep caramely, nutty, toffee flavor with notes of hazelnut and toasted buttery-goodness, that will shine through in every bite of your dish. 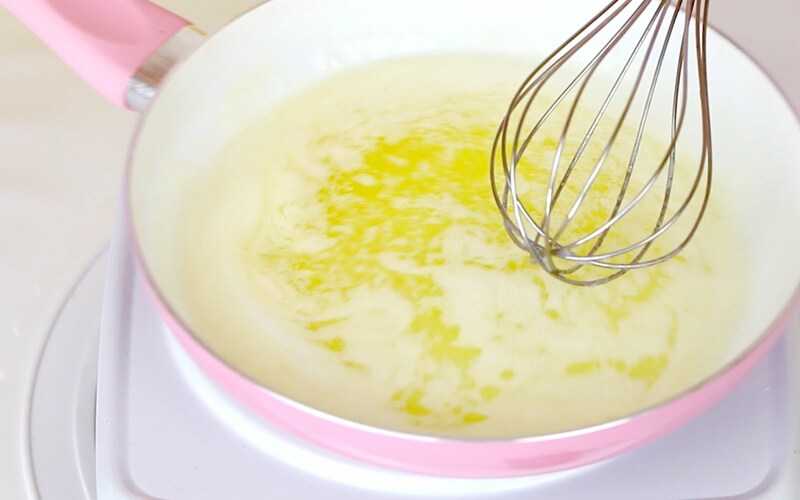 You can use it in savory dishes and sauces or sweet desserts to add a whole new dimension to the recipe. 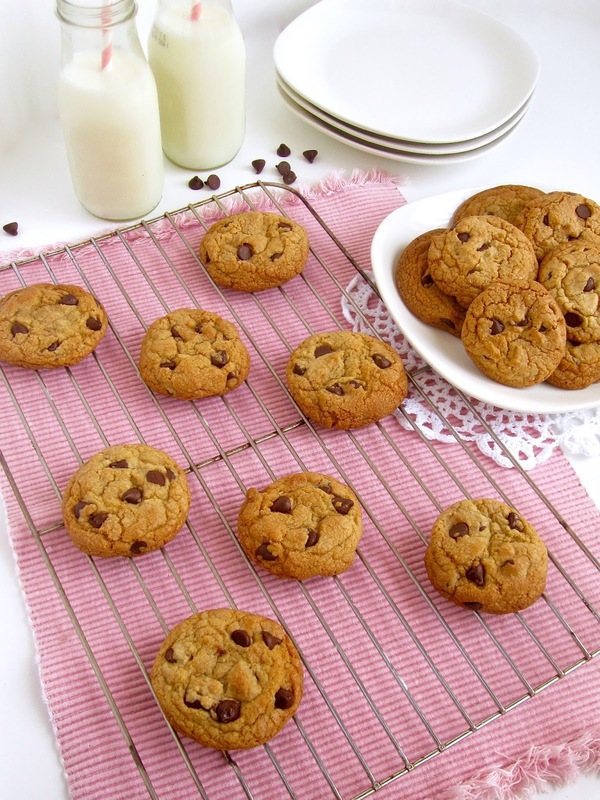 It gives my chocolate chip cookies a wonderful toffee flavor. 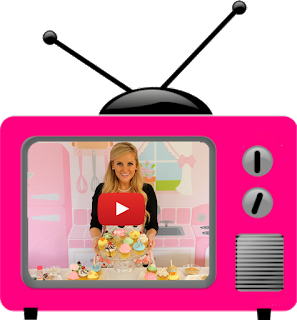 It lends rich dimensional notes when paired with the brown sugar in my favorite chocolate fudge brownies. 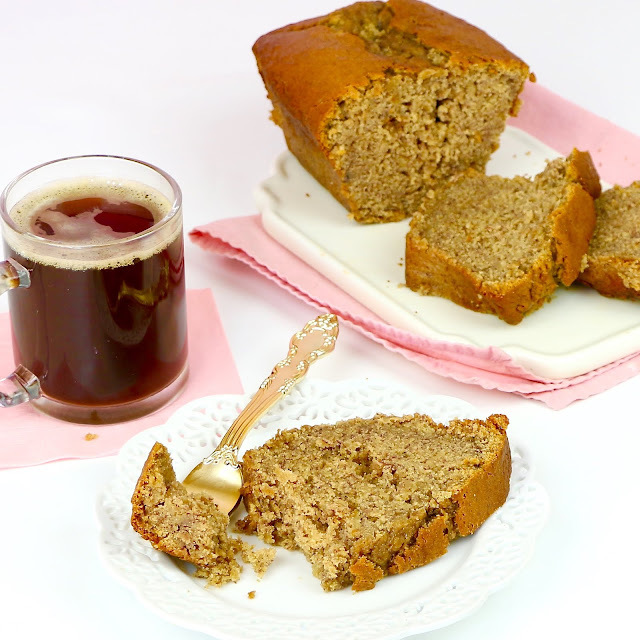 It takes my banana bread from classic to THE BEST EVER! And it's just perfect in a batch of warm oatmeal raisin cookies. Place your butter on the stove in a saucepan (try using a light colored pan if it is your first time, so you will be able to see the color of the butter beginning to turn brown). 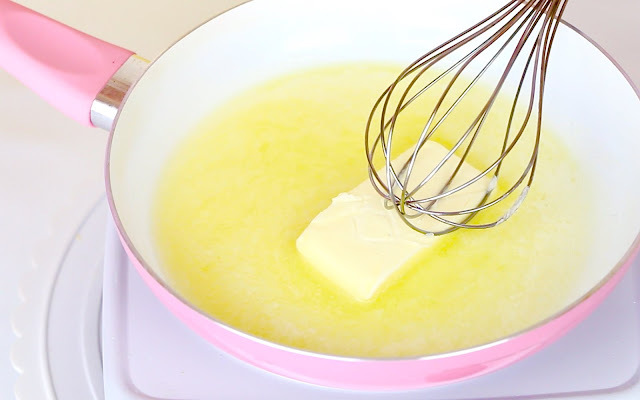 I always use unsalted butter for my recipes so I can add the salt separately to control the amount. 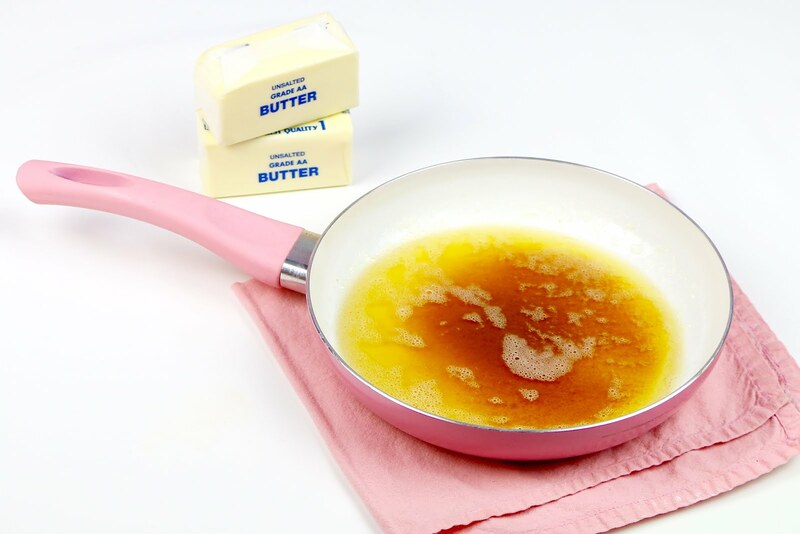 Over medium heat, melt whatever amount of butter you need for your recipe in a saucepan. 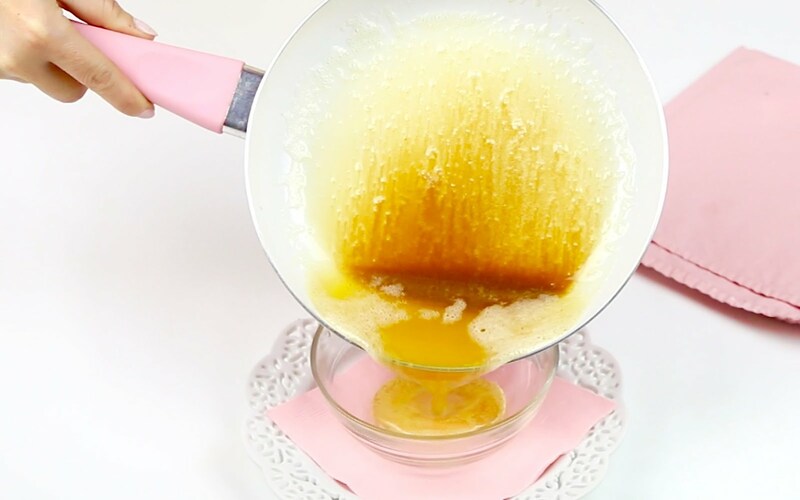 As it starts to boil, bubbles will appear. Keep stirring! 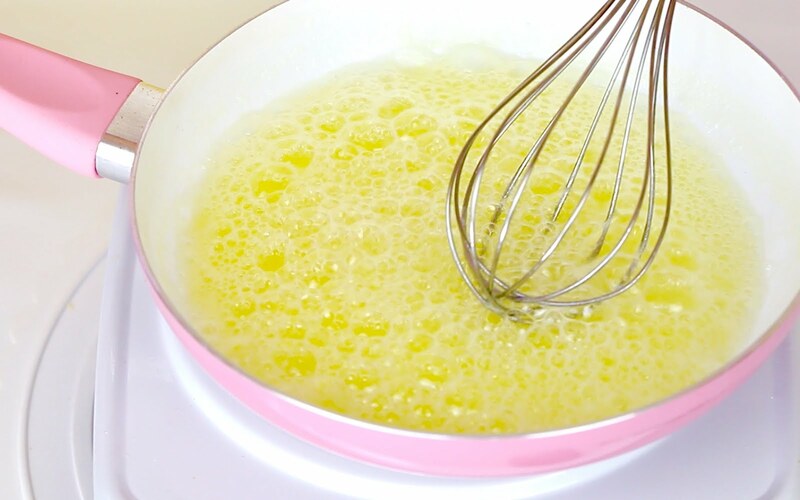 Continue to cook the butter until it starts to bubble up and foam. 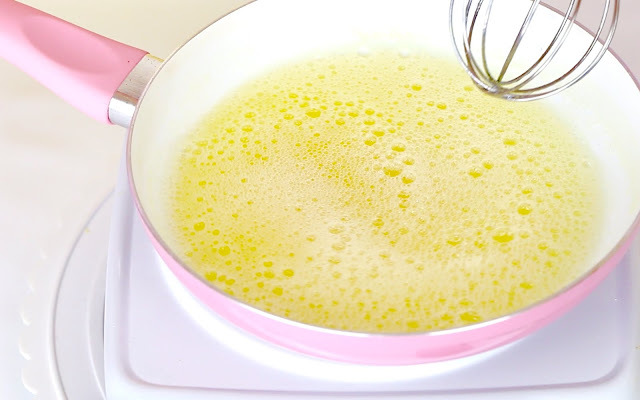 Constantly stirring or swirling the butter around in the pan until the foam starts to dissolve. When you see brown specks start to appear at the bottom of the pan and your butter has turned a light shade of amber and gives off a warm nutty/toffee scented aroma (about 5 minutes for 1 stick of butter), your butter is starting to brown. 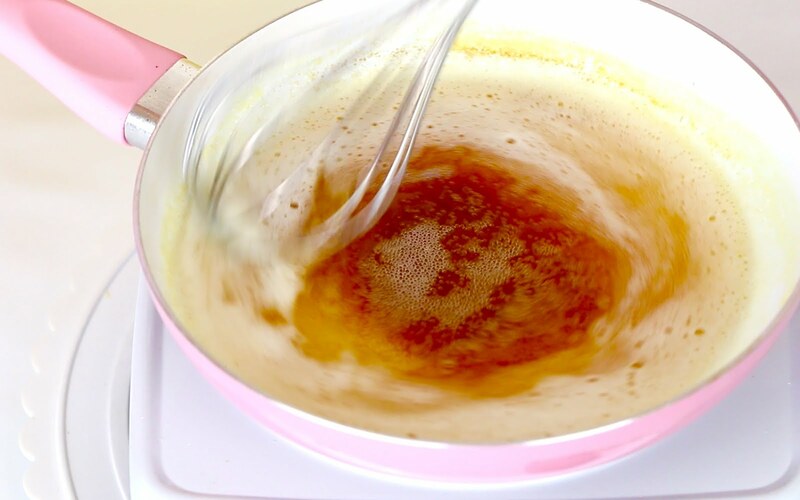 At this point, do not stop stirring! 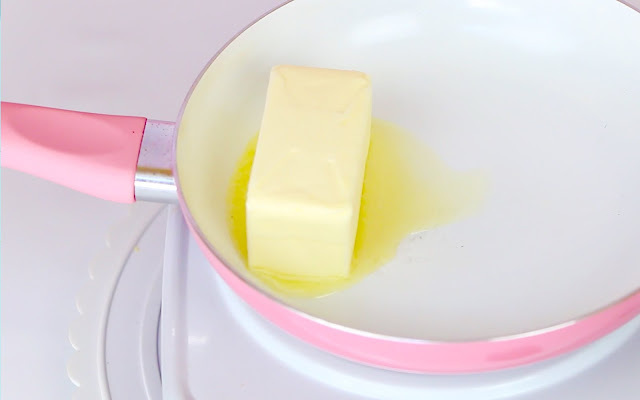 The shade can vary depending on how light or dark you want your butter. 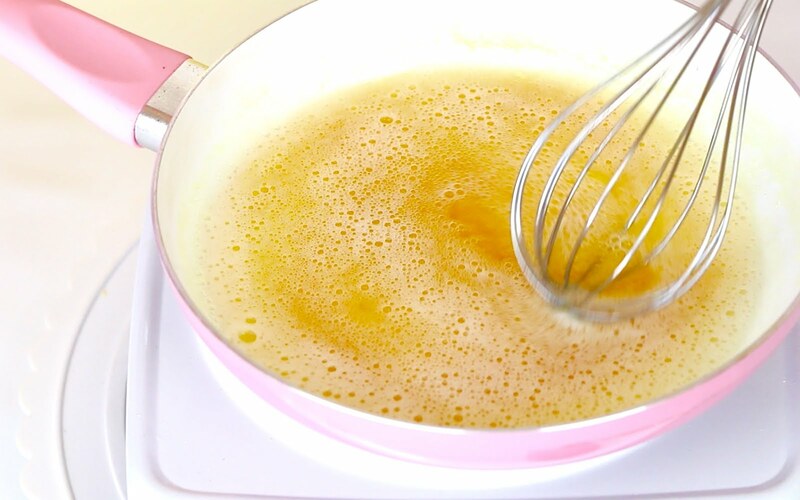 If you have burnt your butter, you will know by the scent and the amber colored specks at the bottom will have turned black. 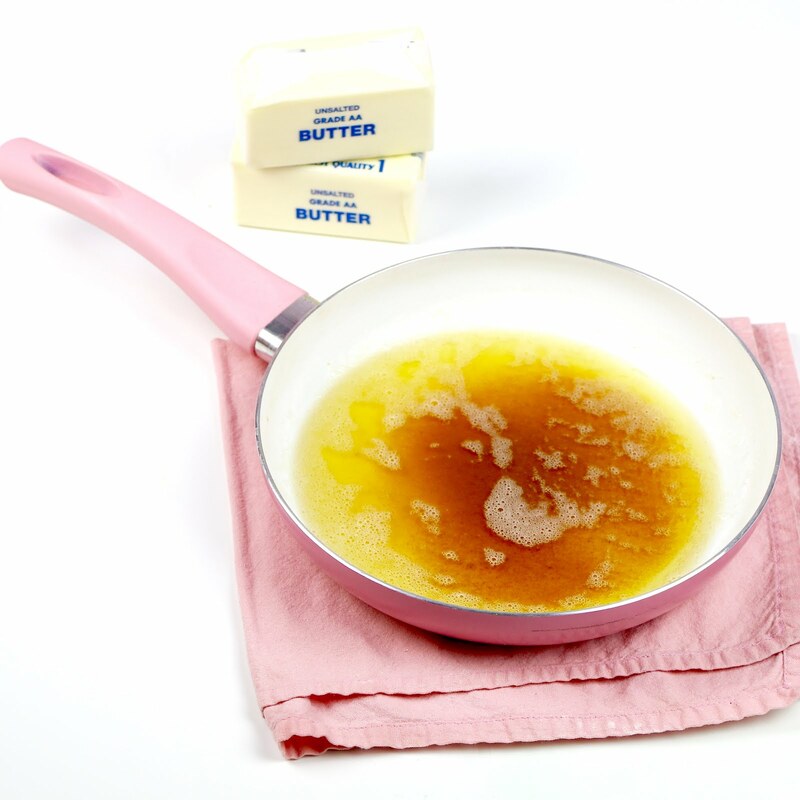 Immediately turn off the heat and pour your butter into a shallow heat proof bowl. 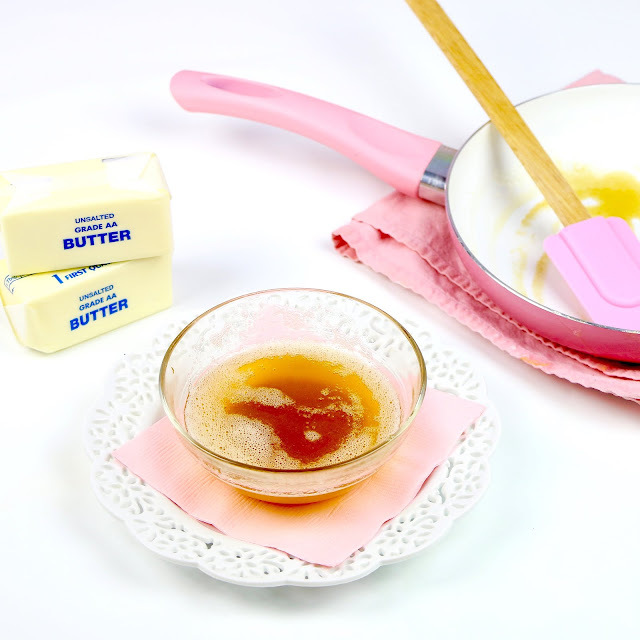 The butter will continue to cook in the pan so be sure to remove it, as the butter can burn very easily and turn from a perfect caramel scented brown hue to burnt and blackened within seconds!